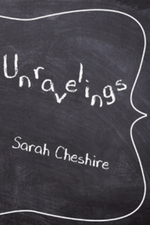 In Unravelings, Cheshire’s narrative explores the relationship between her college professor and herself, what was once pure and innocent quickly turned to something else. When an inappropriate situation occurs between the two, she is faced with a choice. Does she finally come to terms with the person she thought he was and the person she once fought so hard for, or the man he truly is? Along with documented texts and emails, and with Title IX getting more involved in these types of situations, Cheshire describes her experience, feelings, and inner thoughts regarding the professor and the situation. Etchings Press: What is your writing process like? Sarah Cheshire: For some reason, I have always worked best late at night. I think this has something to do with needing a space where I can be completely free of distraction. When I am in the middle of a project, I become semi-noctural. Sometimes I think maybe I am a bit of a witch. I use the day time to conjure inspiration and let ideas simmer. When night falls, I hunker down, play weird acoustic music under the moonlight, burn some sage, mutter incomprehensible thoughts aloud to myself, and brew words in my word caldron (aka my macbook). I am also blessed to have a wonderful network of writer-friends whose feedback is incredibly valuable in my writing process. Despite my witchy tendencies, I see myself as a part of a larger discursive writing community, and not just as a hermit with a pen. I think that, when I surrender my writing to others for constructive criticism, whatever I produce in my otherworldly insomnia-induced state transforms from personal expression into something that might resemble art, capable of speaking to an audience beyond myself. EP: Who is your favorite author? SC: What a question! Adrienne Rich was the first person I read who allowed me to understand how writing can be used as a tool of social change and personal reclamation (before finding her, I kind of thought all writers had to be sad and live alone in the woods). She will always hold a special place in my mushy literary heart. More recently, I’ve been loving the writing of Natasha Trethewey (former U.S. Poet Laureate) because she so evocatively grapples with themes related to ghosts and muted histories in the American South. As a deeply rooted Southerner, I really admire writing which isn’t afraid to dive right into the often-fraught yet very resilient narratives of this region. Also, for a cathartic release, David Sedaris is always my go-to. Also Jonathan Safran Foer! EP: What made you start writing? SC: When I was probably about seven years old, my mom would take me grocery shopping with her. One day, I think frustrated by me constant pestering for candy, she bought me a little composition notebook and a gel pen and told me to sit on the bench near the check-out aisle and write down five things I observed about different people checking out. After this day, I started begging to go to the grocery store so that I could keep playing this little game, which we called spy time (I think I was also going through a Harriet the Spy phase at the time). I got super into making up weird little backstories for strangers, and started to develop an eye for idiosyncrasy and quirkiness, especially when it came to other people. As I grew into a teenager, my journals evolved from being documentations of my external world to sacred places where I was able to delve into my own internal world. I was a very introverted, sort of angsty teenage (which a lot of my friends now find hard to imagine) and writing was a way for me to take ownership over feelings of loneliness, and turn them into moments of introspection. EP: What genres do you enjoy reading? SC: I started out aspiring to be a poet, and I find that my work is still heavily influenced by the poetry which inspired me as a teenager, especially in my desire to balance storytelling with lyricism. Even when I read prose, I find that I need viscerally stirring language in order to stay invested in the content (which is definitely personal preference). Also, as a creative nonfiction writer, I am always drawn to a good memoir; especially one that combines honest storytelling with a degree of humor/ satire. EP: What do you think is the most difficult thing about writing? SC: Trusting myself enough to believe that the stories I want to tell are worth telling. EP: What made you want to write Unravelings? SC: Going into my M.F.A. program, the situation I wrote about in Unravelings was still very fresh on my conscious. Whenever I would sit down to write, I would still feel like I was writing under the critical eye of the man who evaluated my creative work throughout college; whose mentorship both sculpted my creative voice and ultimately undermined the confidence I held in this voice. This might sound melodramatic, but throughout my process of writing Unravelings I kept thinking of a line in one of Virginia Woolf’s essays: “Killing the Angel in the house [is] part of the occupation of a woman writer.” To Virginia Woolf, the Angel in the House represented the pressure women writers face to write the versions of themselves that men want to read, rather than their true selves. To me, the Angel in the House was the looming feeling that I was still writing to appease my college mentor’s toxic gaze. I knew that I needed to, metaphorically speaking, “kill” this gaze in order to reclaim my own voice. Unravelings was the first piece I completed as a graduate student. I wrote it, in a sense, because I felt I wouldn’t be able tell other stories until I’d fully unraveled this one. EP: What is your favorite childhood book? SC: It’s a three-way tie between Where the Wild Things Are, The Velveteen Rabbit, and Harriet the Spy. EP: How much time did you spend writing Unravelings? SC: Four months, which included three drafts and probably about six revisions. EP: How do you market your work? SC: Sending it out into the ether and seeing what happens! Not taking rejections personally (even though that is difficult sometimes. When it comes to the publishing phase, approaching the publication process as collaborative rather than transactional. EP: What are your other passions? Backwoods backpacking; protesting Trump & getting riled up about various social issues, especially those involving labor (in)justice or reproductive (in)justice; picking and canning vegetables, getting lost in the woods with my dog; bluegrass music; anything that involves the Dixie Chicks and/or Beyonce (preferably on stage together), reading ’til I need a new glasses prescription; documentaries, podcast & other forms of multimedia creative nonfiction work. EP: What is your favorite thing that you have written? SC: Probably a story I wrote as a sophomore in college about my mom. It is definitely not the best thing I’ve ever written, and almost no one has read it besides me, a couple close friends, and the professor of the course I wrote if for, but it was a story I had been struggling to tell for a long time and that felt stuck inside of me. Writing it was a very fraught process because it involved working through a lot of complex feelings—mainly involving my relationships to my home and the person who brought me into this world—but once I was done it felt like a weight was lifted off my shoulders. It was a huge step in my growth as both a writer and a person. EP: Who is your target audience? SC: Young women who have lived through some form of (usually gender-based) trauma. If even one person finds this little book and feels a bit less crazy/ alone/ scared after finishing it, I will feel that my work is complete. Ultimately, I hope my stories can reach people outside of this demographic and raise some form of awareness, but this is a secondary (although still very important) goal. EP: Why do you write? EP: Are you working on anything new? SC: Yes! I’m in the very rough draft phase of a memoiristic novel about ghosts and hoarding and matrilineal family history and inherited memory and body trauma, all framed within the overarching theme of “things contained within the gut.” That all probably sounds very abstract right now, but hopefully it will all tie together as the final product becomes clarified. As of now, it is titled Swallowed: Reflections on the Belly & Illness. I’ll keep you updated! EP: What do you wish to accomplish with your writing? SC: To start conversations about murky, complex, under-reported topics. Also, to make people smile (less so in this piece, though). EP: What precautions did you have to take in order to protect the privacy of your those in your story? SC: I tried to obscure the names and identifying information as best as I could, while making sure the essential truths of the piece remained intact—which sometimes felt like a hard balancing act. In doing so, I solicited feedback from multiple trusted friends and mentors, including the former Title IX coordinator at my college who oversaw my case and another trusted mentor who was familiar with the case while it was going on. I also consulted with certain folks at Etchings Press throughout the editing process. They were incredibly helpful! 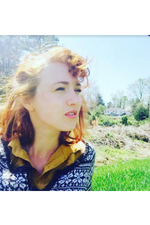 Sarah Cheshire is in her first year of the MFA program at the University of Alabama and works as a nonfiction editor for the Black Warrior Review. Cheshire’s work has appeared in the 2014 Creative Nonfiction Anthology magazine, Southern Sin: True Stories of the Sultry South and Women Behaving Badly, and in Scalawag Magazine. Cheshire enjoys her time at home with her rescue mutt, Dolly Parsnip, and her bluegrass music.